Looking for Memorial Day fashion inspo? We partnered with Crocs to put together head-to-toe looks that encourage you to come as you are for the long weekend. By mid-May, there's one thing that will be on everyone's mind: planning for Memorial Day festivities. This annual Summer kickoff weekend is not only a historical celebration for communities across America but it's also an opportunity for people to get some relaxing done and go on vacation. To make styling for this holiday as easy as possible, we tapped five POPSUGAR staffers who are putting together easy, location-based looks that will transition from the sand to the street in a flash. As the Spring chill finally dissipates, New Yorkers typically flee for the beach. If you're one of the many heading East, be sure to pack the necessities. Go for quintessential ripped white jeans and a classic clog in white. When you're done sipping rosé and want to head to dinner, toss on a cropped sweater that's lightweight — Montauk days are warm, but Summer humidity typically hasn't set in so you'll want something with sleeves at night. What Perri says: "My personal style is very laid-back and trendy, so this outfit captures that perfectly — I always wear white whenever I'm rocking a Summer tan. There's nothing like long Summer weekends with my friends. We get together every Summer to relax at a house in Montauk, spending our days on the beach and our nights at the awesome bars. Did I mention the delicious lobster rolls?" Anyone spending the three-day weekend in trendy Brooklyn is going to pack only the most fashionable pieces they can find. Think refined, elevated, and minimalist as you fill your suitcase. Whether you're headed to brunch or meeting friends in the evening to hear live music, an on-trend ruffled blouse, black jeans with frayed hems, and a classic clog in black will do the trick. 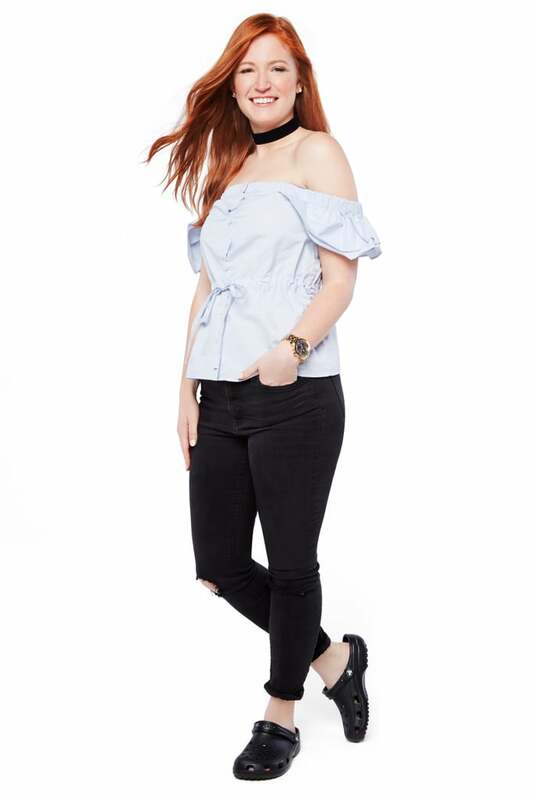 What Kelly says: "I wear ripped jeans when I want a relaxed, laid-back look. I am always on the move, so being in comfy shoes is key for me. I'll wear this as I explore the street art in Brooklyn. Don't get me wrong: I do love living in Manhattan but what's better than a scenic view of Manhattan from a rooftop bar in Brooklyn? It's a good reminder to take a step back and look at the hustle and bustle of the city from a distance." Boho vibes thrive on the West Coast so you'll want to bring whimsical pieces. Try a bright dress with a deep neckline, then layer on thin necklaces for a feminine touch. Finish with a pair of classic clogs in gold that can easily be slipped on and off if you decide to take a dip in the ocean. No need to change postbeach because Venice is home to easy-breezy outfits. 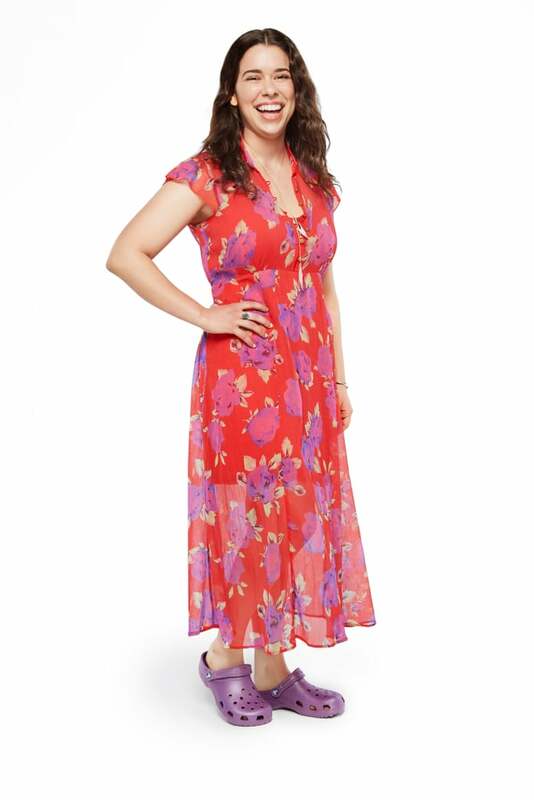 What Meg says: "I love light, airy dresses like this because they look beautiful but are supercomfortable to wear and a complete look. I'm pretty low maintenance so this dress is great for someone who wants to dress up and go for the day with minimal effort. I gravitate toward bright colors, so the dress and shoe combo totally works." Think bold and bright as you prepare for your epic NOLA getaway. Whether you're headed to a jazz brunch or hearing music on Frenchmen street, you'll fit right in in an off-the-shoulder dress and classic clog in gold. What Jasmine says: "New Orleans has been on my travel bucket list forever, so I'm really excited to plan a trip. The dress is one of my go-to colors that I feel confident in. I also love the ruffle/bell sleeve detail, and the shoes appeal to my need to always be myself and comfy when walking around and exploring a new city." To blend in with the "Keep Tahoe Blue" stickers you'll see everywhere, a classic clog in navy should be the focus of any outfit you put together this weekend. Not only is it ideal for lakeside adventures but it's a Tahoe-appropriate color. Finish the look with a feminine dress and denim vest. What Lauren says: "This is the perfect causal outfit to take you from the warm days into the cooler nights. Layers are key, so it's important to have a jacket that adds to your outfit rather than takes away from it. And don't forget the easy shoes. When planning trips, I always try to find a location that offers the perfect mix of relaxation and adventure. What's better than being able to go on a morning hike, bask in the sun, and treat yourself at the spa all in the same day?"